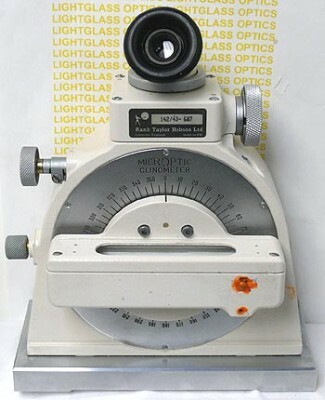 The Hilger Watts 142/43 Type TB100 Microptic Clinometer is a precision inclinometer, utilizing a bubble level co-mounted on a shaft to an internal circular glass scale. When the bubble is exactly centered, the operator locks the circle and reads the angle through the eyepiece. Inside the eyepiece are 2 windows- the Main Scale which reads out in degrees with vernier markings every 10 minutes, and a Micrometer Scale, which has vernier markings every 10 seconds. With interpolation, the operator can easily estimate angular measurement to 5 seconds. This is in excellent condition and comes in its factory wooden case. This will be in hammer finish grey paint, not ivory. New price is now $16,000+ on these from Taylor Hobson.